Started in 1988 at Queen’s University in Kingston, ON, the MBA Games is the largest gathering of MBA students in Canada. Participants compete in athletic, academic and spirit competitions, as well as appear at networking events to meet fellow MBAs from across the country. Dalhousie’s Rowe School of Business made its comeback in 2013 after a three-year hiatus from the games. 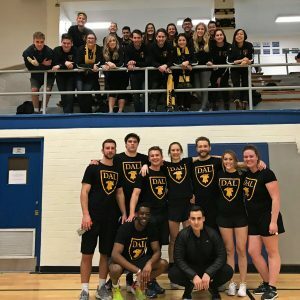 The ABC team discussed this event with Afif Nassif who organized the Dalhousie presence at the games, as well as two participants, Becky Rogez and Kyle Palantzas. The following is a combination of their responses. Where were the games this year? The games were hosted by McMaster University’s DeGroote School of Business in Hamilton, Ontario, January 4-6. All participants stayed at the Sheraton Hamilton hotel and events were held at the main McMaster campus and the Ron Joyce Centre, which is the building for all McMaster MBA students. Twenty-two universities from across Canada participated in the games. Syracuse also sent a small team. There were three main types of competition: Spirit, Academic and Athletics. Dal participated in the opening ceremonies’ team dance competition, all four academic cases (Finance, Crisis Management, Strategy and Marketing) and two of the four athletic events: basketball and volleyball (the others were floor ball and dodge ball). How many Dalhousie students attended? Fifteen Dal students attended. Twelve were in second year (2013 cohort) and three were in first year (2014 cohort). The second-years were Mahmoud Zeidan, Kareem Sobaih, Kerry Bullock, Sara-Beth Harrison, Kaetlyn Graham, Ryan Meyers, Lyndon Bentley, Eric Dunford, James Ewart, Jen Jackson, Mike Parcon and Kevin O’Hearn. First-years were Becky Rogez, Kyle Palantzas and Lauren Glass. What were your roles surrounding the games? Becky was the team captain, and played basketball as well as participating in the crisis management case competition with Kyle. What awards did Dalhousie receive? Dalhousie won the best showing at the opening ceremonies, first place in the crisis management case competition, third place overall for academics, and the “Mini Cup” which is an award for the most points per participant. For the finance and marketing case competitions Dalhousie was in the top five and top 10 respectively. How do you believe this experience has been beneficial to you? What did you learn—anything specific? Can you talk about the excitement/challenges associated with the games? What was the highlight of the games for you?